Risk based inspection (RBI) is a method in which assets are identified for inspection based on their associated risks as opposed to a predetermined fixed time interval. In other words, it is a prioritizing and planning tool, predominantly used in the oil and gas industries, which aids in the identification of high priority items (i.e., those with high risk) vs. low priority items (i.e., those with low risk). This approach allows the users/owners of the assets to maximize the effectiveness of their inspection resources by concentrating them on those assets that pose the highest risk and not wasting resources on assets that are, in essence, inconsequential. 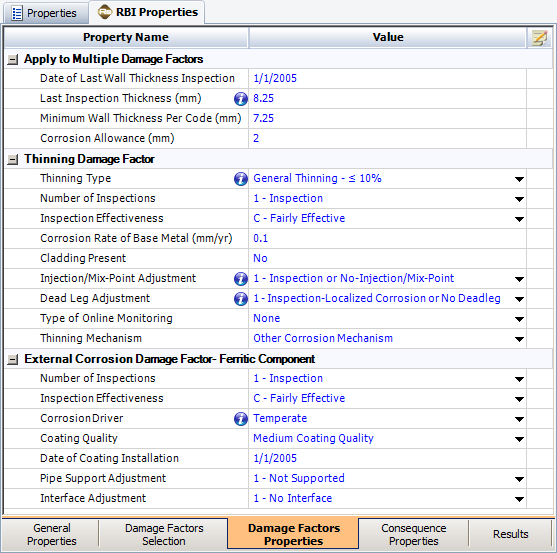 In this article, we describe the basic concepts of risk based inspection, and then provide an example using ReliaSoft’s new RBI software tool. Risk is usually considered a better measure for prioritization than either the probability of failure alone or the consequence of failure alone, because it is more descriptive of the actual damage/loss caused. 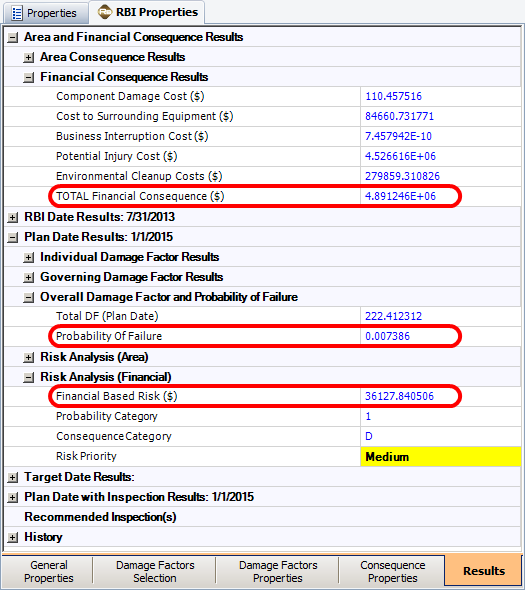 As an example, if you need to prioritize two assets where one asset has a high probability of failure but low consequence of failure, and the other asset has a low probability of failure but a high consequence of failure, the analysis would yield completely opposite results if you considered only one factor or the other. The use of risk eliminates this ambiguity. gff is the generic failure frequency. FMS is the management system factor. Df(t) is the overall damage factor. The generic failure frequency is based on industry averages of equipment failure. The management system factor is a measure of how well the management and labor force of the plant is trained to handle both the day-to-day activities of the plant and any emergencies that may arise due to an accident. 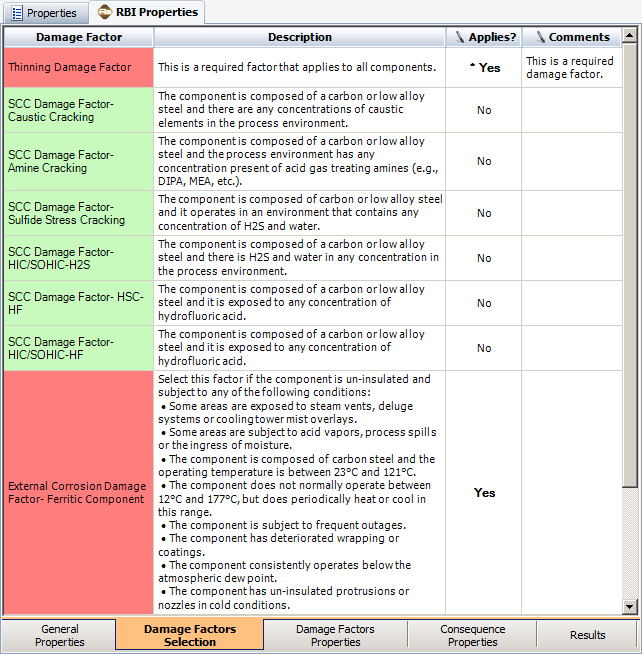 The overall damage factor is the combination of the various damage factors that are applicable to the particular piece of equipment being analyzed. The consequence of failure is calculated as the combined values of the consequences for damage to the failed equipment, damage to the surrounding equipment, loss of production, the cost due to personnel injury and the damage to the environment. The consequence of failure can include both a financial consequence (FC) and an area (safety) consequence (CA). FCcmd is the financial consequence to failed equipment. FCaffa is the financial consequence to surrounding equipment. FCprod is the financial consequence due to production downtime. FCinj is the financial consequence due to personnel injury. FCenviron is the financial consequence due to environmental damage/cleanup. CAequip is the area consequence to surrounding equipment. CApersonnel is the area consequence to nearby personnel. 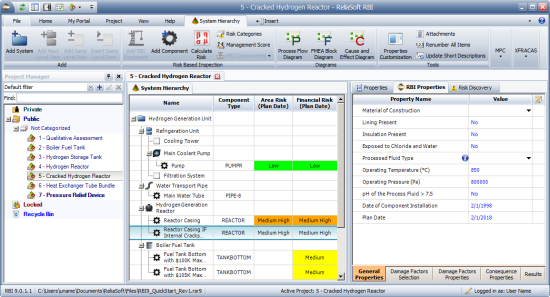 ReliaSoft’s new RBI software tool has all of the functionality of RCM++ and facilitates risk based inspection (RBI) analysis for oil & gas, chemical and power plants in adherence to the principles and guidelines presented in the American Petroleum Institute's recommendations in the API RP 580 and RP 581 publications, as well as the American Society of Mechanical Engineers’ recommendations in the ASME PCC-3-2007 publication. 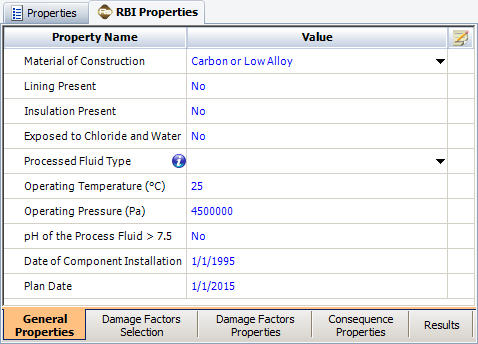 RBI also includes all of the standard features available in RCM++, such as being able to perform a functional failure analysis on an item and/or create a DFR planner. 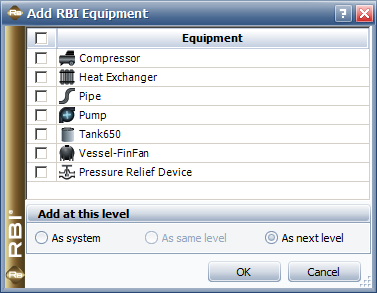 The RBI interface is identical to RCM++, with the addition of RBI specific options on the System Hierarchy tab. The equipment and component types that are available for RBI analysis are currently limited to those addressed API RP 581. The available equipment types are shown below. 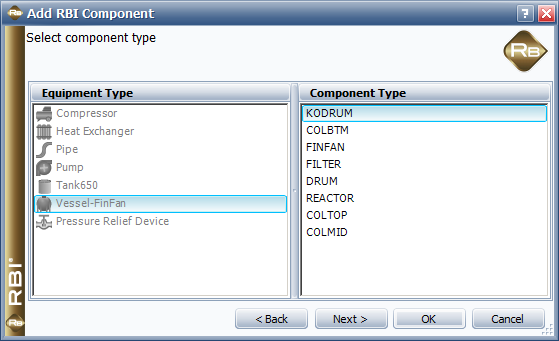 Each equipment type also has associated components. 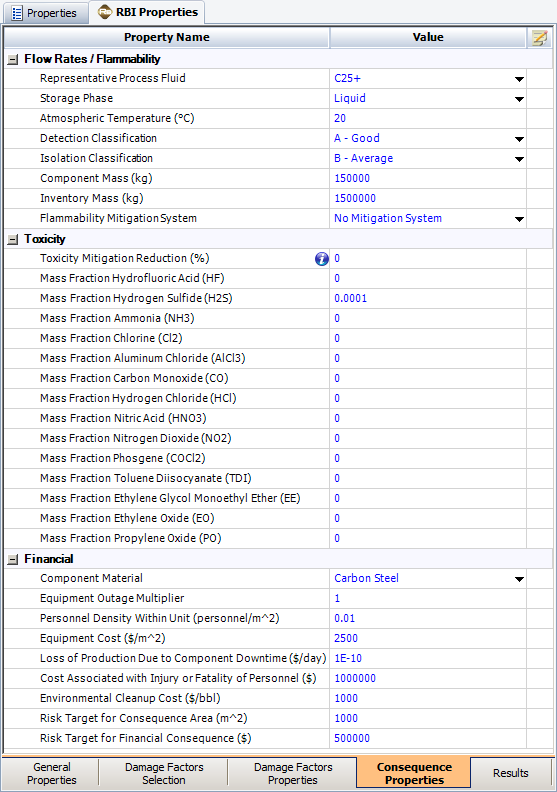 For example, the Vessel-FinFan equipment has the specific components shown below available for analysis. While the system hierarchy can contain items that are not RBI-related, those items will be ignored when performing an RBI analysis. For example, in the following picture the system is the hydrogen generation unit, which has several items that receive RBI analysis and several that do not. Once you create the assets, you must answer questions and fill out the relevant properties for the asset to be analyzed. All of these inputs are used to create a failure model that determines the probability of failure, and calculates the consequences of failure. The results also include the recommended inspections, if any, that should be performed to keep the asset under the maximum allowable risk. 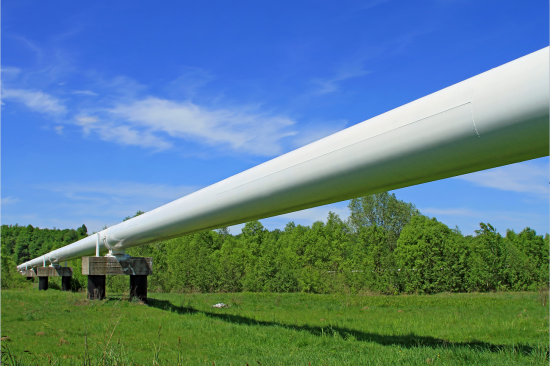 A small town wants to do a risk analysis on a proposed high pressure 24-inch pipe carrying crude oil for which the oil transportation company is willing to pay a rent of $500,000 in advance for the next 20 years. The company will also perform an inspection on the pipe halfway through the rental period. Since the city is self-insured and is not willing to take any financial chances, the city council would like to know if the $500,000 offsets the possible risk associated with the pipe. The city has requested the required information from the oil transportation company to conduct its own RBI analysis of the pipe. The pipe is composed of carbon steel. The heavy crude, which contains 100ppm H2S, is being pumped through at an operating temperature of 25 Celsius with a pressure of 4.5 MPa. The only two damage mechanisms expected are general thinning and external corrosion. For their analysis, the city assumed that the effectiveness of the performed inspections was average. All other property values were estimated based on other similar pipes used elsewhere. The city based the financial portion of the consequences on the current population density and the property values around the proposed pipe area. For the initial estimate, the city did not take into account inflation or any possible losses associated with property value changes, nor possible resident dislike of the pipeline across city land. The analyzed results show that in case of a containment failure of the pipe, the expected cost associated with a failure would be almost $4.9 million. This far exceeds the $500,000 payment to be received. However, the probability that a failure will occur within 20 years under normal circumstances is estimated to be only 0.7%. Therefore, the expected financial risk is the product of the two, or a little over $36,000. This is well under the $500,000 payment to be received. In terms of a cost analysis of the risk, and not including the potential loss in property value by having the pipe run across city property, the city council recommended that the community accept the proposed pipeline as an additional revenue source with minimal risk. American Petroleum Institute, API RP 581 Risk-Based Inspection Technology 2nd ed., Washington, D.C.: American Petroleum Institute, 2008.